The case this week wasn't hugely interesting, but it was certainly entertaining. There's a worry a show like Hannibal will quickly devolve into formula, by simply providing audiences with a stream of serial killer with slightly different m.o's, but for now the series is finding ways to have the week's psycho echo something happening in the lives of the regular cast. 'Coquilles' concerned the hunt for a serial killer known as the Angel-maker (so-called because he flays his victims alive, butchers their back muscles to resemble angel wings, then poses them with the use of fishing wire). This resulted in more of the show's surprisingly graphic crime scenes; the most memorable being a grim tableau of a married couple praying around the motel room bed the killer slept in, with their shoulders torn out to resemble wings. We eventually discovered that the killer has inoperable brain cancer, which neatly echoed the fact Jack's wife, Bella (Gina Torres), has lung cancer and is keeping it a secret from her husband. A secret that Lecter (Mads Mikkelsen) quickly discovered during an evening meal with the Crawford's--commenting on Bella's perfume, but regaling them with a story about how he once smelt a teacher's stomach cancer, as a subtle hint that he's done likewise with her. It was great to get more of a sense of Jack's home life, and I think Bella's a nice addition to the show. I like Gina Torres' work, and perhaps because she's married to Laurence Fishburne in real life their scenes together feel all the more genuine. It's a testament to Hannibal as a TV show that the most memorable scene in a story about a man who flays the flesh off people while they're still alive actually involved Jack being told of his wife's cancer. Fishburne and Torres were fantastic in this episode, and I also like how the show's developing Jack's relationship with Will. 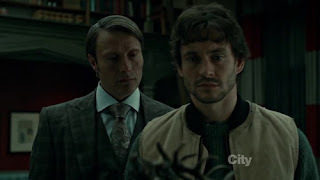 Lecter claims Jack has manipulated Will back into field work; exploiting his ability and not caring about the mental repercussions now Will's started sleepwalking (on top of hallucinating a large feathered stag). Will appeared to be swayed by Lecter's argument, but I think he ultimately agrees with Jack that turning a blind eye and going back to his classroom full-time would be worse. 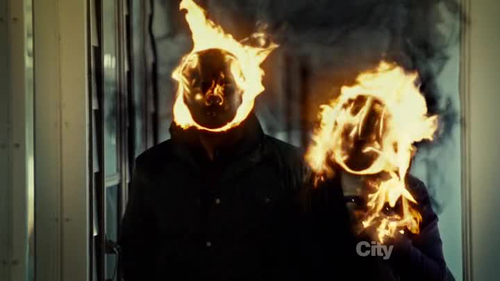 One of the joys of this series is watching Lecter try to crack Will psychologically, and cause disharmony in his relationships with Jack and Abigail. Will is oblivious to the fact he's essentially Lecter's plaything, which makes their scenes together all the more compelling. Overall, "Coquilles" notches up another success for a show I'm now fully behind. 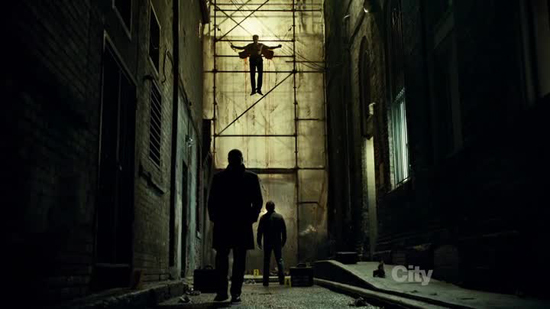 I didn't expect to enjoy Hannibal quite as much as I do, but it's great on so many levels beyond the sheer visual quality. 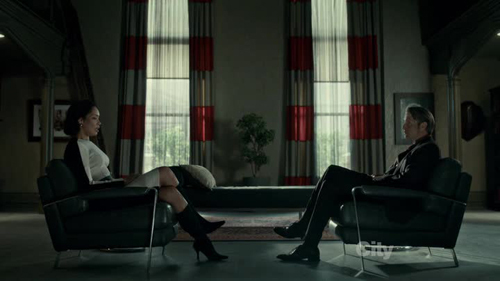 The acting and storytelling has been really strong, even if I fear Hannibal might eventually become a little predictable. How long can Will not realise his own shrink's a serial killing cannibal before it becomes a joke? How many sick and twisted killers can you tell stories about, before audiences become accustomed to the shocks and how the plots tend to arc? There's already a slight reliance on forensic science (certain tumour-shrinking drugs were discovered in the killer's vomit), and Will's insights can occasionally feel too "psychic". Hopefully the show will maintain a balance; providing more case-cracking moments through old-school detective work, which is far more satisfying for viewers... and part of the reason shows like Sherlock are such a hit right now.